From retrofitting to bees via solar farms, this weeks crosses the globe to find the most interesting stories last week. First up the bee highway in Oslo that is helping to transform the city. The idea is simple – wherever possible flowers are being planted in the city to help bees and other pollinators. Of course in the world of insects, a highway is not linear, it is three dimensional. So part of the routes involve green roofs high on the buildings of the city. ByBi, an environmental group in the city, recently designed a bee highway. The route is filled with green roofs and flowers. The route is not only help Honey bees get around town, it is also aims to help some of the 200 Norwegian bees that are endangered. It is always good to hear that solar panels are helping to support pollinators. A great piece about solar farms in Minnesota outlines how new guides are there in the state to support both pollinators and renewables. IN the light of this we are still getting reports that many designers do not recognised that green roofs can be combined with solar panels. And in doing so, if planted well, they can and do support a wide range of pollinators. Retrofitting green roofs featured in a number of interesting news items last week. Down in Melbourne, an refreshing concept was outlined – community rooftop gardens. These types of green roofs could challenge one of the perceived barriers to green roofs. As the cost of maintenance is a factor often cited against the use of green roofs. If maintenance is taken over by the community, the costs are reduced. those reducing the costs. Of course the advantages to the community, especially in urban areas, with limited access to green space are obvious. More community green roof gardens are surely a good idea. Our final round up of last weeks news comes from London. 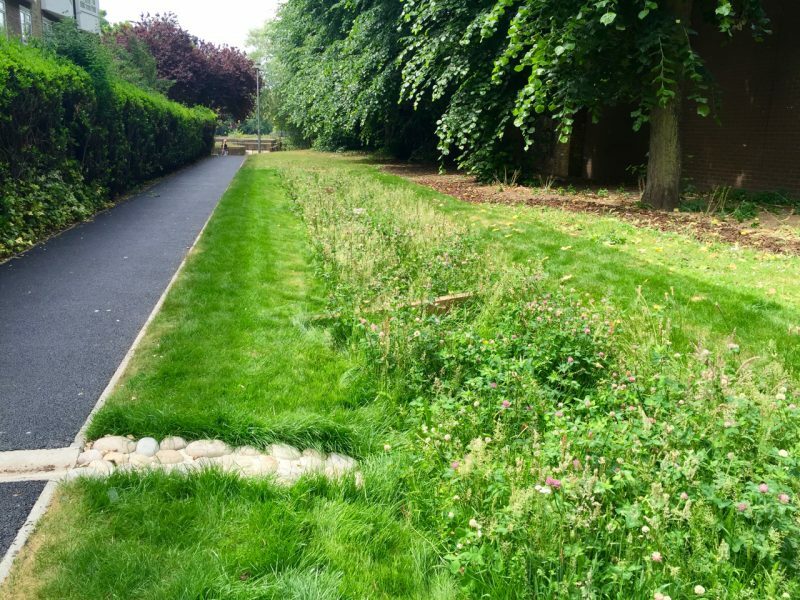 A ground breaking project on housing estates has used green infrastructure to improve a number of housing estates in the city. Using rain gardens and small green roofs, the project delivered climate proofing and improved amenity spaces within the grounds of the three estates. The project proved that these green infrastructure interventions can be implemented in the existing urban realm. Furthermore, they are probably an important element of an unofficial bee highway in London.